This little/big Golden Retriver had just arrived at the La Junta pound the day or two before we got there, so it had to stay, and we couldn’t take it with us. 😦 Legally, the pounds must keep the dogs for 5 days so the owners can come a find them. After 5 days, they put the dog “up for adoption” aka give it a few days before they put it down. The black and brown dog, sammy, is only about 1 year old. Brand new adult teeth. I forget if it was a boy or a girl, so I thought sammy would be a good middle of the road name ( ill just say she’s a she for now). She was so scared in the little cage and shaking so I took her out to play with her and she couldn’t have been happier. It took her about 30 seconds to jump into my arms. She was just the best little dog. The last little guy, sancho, was the cutest little thing I had ever seen. A long haired german shepard, I was told? He still has his baby teeth and is fluffy as can be, and quite a big puppy. He is going to be a big boy! this little corgi/chihuahua was picked up by a rescue in Wyoming. She was the sweetest pup, and just sat in Ashley’s lap the whole drive home. Probably because she had just been attacked by satan dog, but also most likely becuase she was a stray. She was very underweigh and very skiddish of any sudden noises. However, she was quite the lover and just wanted to be held and loved giving kisses to the big dogs! This husky mix, was also most likely a long time stray or maybe just a runaway. He was an expert escape artist, but was also a very good companion in the car, he napped almost the whole way from La Junta to Denver! He is now in a foster home, but they are hoping to adopt him! Charlie is a staffordshire terrier/mixesh type. He was such a gentleman, and didn’t mind being crammed in the back seat of the car with 8 other dogs. I just think he was happy to get out of the pound. My friend Sarah is fostering him and he is loving every minute of it. I don’t think he will be their foster pup for long, because I have a feeling they are going to adopt him and make him an “official” member of the family, although he already feels like the king of the castle! he puts the world Gentle Giant into action. It was hard to let him go, even though i only knew him for a few hours, it felt like he had been my pup for ever! no photo yet. brown/tan terrier mix. 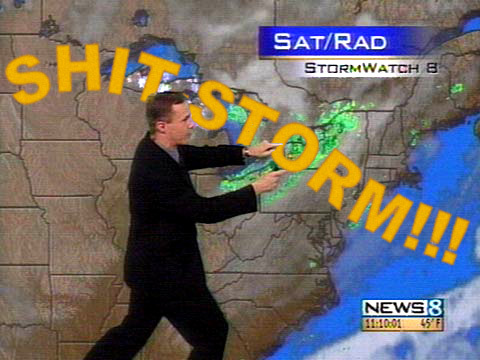 YES A REAL LIFE SHITSTORM IS WHAT BLEW IN yesterday…. So I was thinking I would start my blog off in 2012 talking about all the changes I am going to make this year, and how i am going to get so fit going to the gym and eat health and all the crap, but I had such an amazing day yesterday I could not possible handle overriding THE SHITSTORM with some sappy entry about me..instead I will talk about poop, and dogs and worms in poop. enjoy. As many of you know, I love dogs. I love them more than most of you think, not in a sick way, just in a “i’d rater ruin my carpets with dogs, than my life with children” kind of way. So I have really amped up my involvment with local rescues and shelters in Colorado, trying to do my part to help lower the number of dogs that are euthanized in Colorado every year. Last year there were 50,000 recorded euthanizations of dogs in colorado, I’d go ahead and be that there were actually many more. So, here I am little miss colorado dog saver extrodanaire driving all over this god forsaken farm state trying to help save some dogs. This past weekend I ventrued to the lovely town of La Junta, Colorado. Never heard of it? don’t worry, I don’t even think the people there know what their town is called, except for the sweet little volunteer I met at the shelter, Sallie, she runs that town. Anyways, my friend Ashley and I decide to drive do to that little green star and pick up a bunch of stray dogs that would have been otherwise euthanized on Saturday. The drive down wasn’t too bad, not to much to complain about, I mean nothing to complain about becuase there was absolutely nothing out there. Except for a few hitchkikers and a prison. Getting to the shelter was NOT the problem. It was getting the 8 dogs into the back of my Subaru Outback. Not MY subaru, my friends. My friend let me borrow her car to drive it all over the state of colorado and pick up a bunch of random dogs. She is awesome. Although I don’t think she will ever let me do that again. A” yeah, a huge poop, its everywhere all over the dog, all of the seat cover, behind the seat cover, on the passenger chair. And there are worms in it, lots of worms”. the town of no sleeves, no teeth and no dog control. sorry i have been gone for so long…but I AM BACK FOR GOOD!!!! the last post i entered was so long ago I can barely remember…and well let’s face it you probably didn’t even realize I was gone. But I am back, with a vengance. I am going to add this to my list of 2012 resolutions, I mean I have room for more resolutions since I have failed on about 50% of them and it is only Januray 11…but this one I will not fail on. I PROMISE. although I don’t think I can continure to post every day for all of my fans, it really is just too exhausting. I will aim for every day, be happy with ever other, and settle for twice a week. but that is IT! and that is my promise to you for 2012. I have lots of tricks up my sleeve for you, so you are welcome in advance.